The canopy may slope to the back. This makes drainage better, and in some circumstances (a very low Rugby stand for example) allows spectators a better view of high balls. 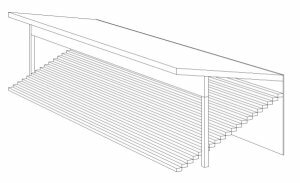 However, in stadiums or grandstands with a sloping roof it lets in more rain and wind, sometimes right to the back; and produces much more shade to the pitch. In cold windy climates the backs and sides should be filled in. In hot tropical climates the back should stay open for maximum ventilation and pressure reduction. In cyclone or typhoon or hurricane areas, cable ties at the front of the stadium may resist uplift, without obstructing the view. 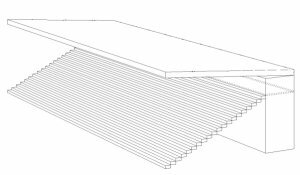 Generally stadium roofs serve their purpose better if they slope down at the front. One difficulty is getting rid of the rain, which may have to be by syphonic pipes either end. Another difficulty is seeing the high ball in cricket, football or rugby, especially in small low stands. But such stadium roofs give much better protection from driving rain and setting sun. Such stadium roofs are essential on east or west sides of tropical cricket grounds. 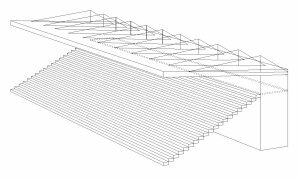 A grandstand which is short in length (say the end stand at a football ground), but very deep (which would make cantilevers expensive) may be made economically with a King Truss or Goal Post Truss spanning end to end of the stadium. Here the King Truss is below the stadium roof, good for drainage and maintenance, but results in a high fascia. This cannot be used where corners will be in filled. 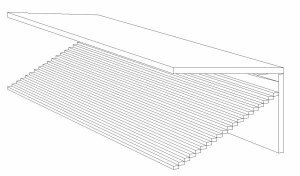 A stadium roof may be suspended from a goal post (King) truss, and thus slope forward. This is good for planning, protection and so on, but the drainage from the roof is more of a problem. 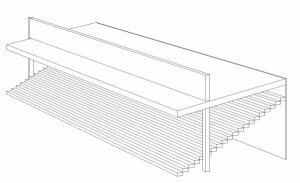 Penetrations through the roof may be minimised by cladding the truss. Football stadiums such as the Holte End at Aston Villa, the Tranmere Kop and Notts County Cop have variants of this stadium roof. A stand may be cantilevered on internal steel from the rear. 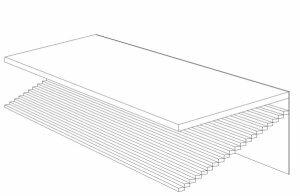 If the roof slopes up or down, this is most often the best way of building the stadium. Under cyclone, typhoon or hurricane conditions slender ties may be needed to tie down the front of the stadium roof. The cantilevers are always best on long narrow stands. 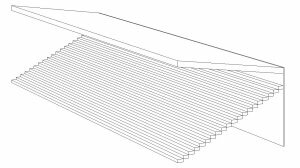 A way of cantilevering a stadium roof is over a "box" zone at the rear. This can have studios, boxes, police posts, sales points or simply be a platform for rear exit. In tropical areas REIDsteel like to keep this back concourse as open as possible. In wet cold windy climates it should be closed off. The zone also permits large areas of accommodation to be built underneath. These architectural designs look very attractive when they are first built, however there are many problems associated with the external cantilever canopy. The painted steelwork rusts after a few years, the canopy is flexible resulting in the seals around the many roof penetrations being broken causing leaks. OK, it does save a bit of weight in long cantilevers, but the maintenance costs can be huge as the building gets older. An economic and stylish stadium roof. The clear span can readily go up to 150m in length and is economical. The lower height both ends can be a boon in some planning situations, and it is no higher at the centre than a normal King Truss. These frames use the REIDsteel patent Archspan, Aircraft Hangar frames. 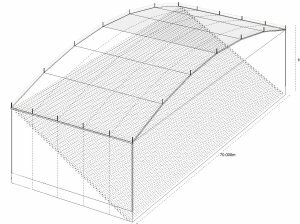 A Covered Arena can easily and cheaply be made up to 200m clear span if REIDsteel can design it in combination with the internal grandstanding. 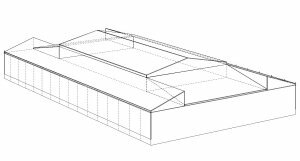 If treated as a structural engineering problem, then an Arena or stadium with a retractable roof can be built quickly, simply and economically. Grandstanding, and vertical grandstanding in the 4 corners adds to the design and adds to economy. No columns need mar the view.